The Clover on Yonge is a new mixed-use high-rise condominium development currently in pre-construction at 587 to 599 Yonge Street, 2 and 4 Dundonald Street and 7 and 9 Gloucester Street in Toronto, Ontario by Cresford Development Corporation. It consists of a proposed 44 storey residential building with 420 dwelling units on top of a four-storey podium with retail commercial use space. 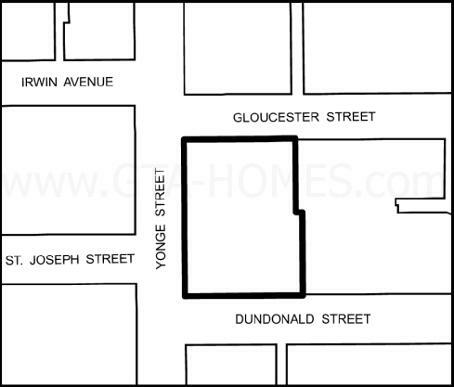 The Clover on Yonge Condos is located on the east side of Yonge Street and will occupy the entire block between Dundonald Street and Gloucester Street and will be approximately 148 metres (including mechanical penthouse) tall on top of a 4-storey base containing retail commercial uses. "The site currently contains six buildings ranging in heights from one to three storeys and a mix of uses including residential, retail, and office. Some of the buildings were built in the late 1800s and early 1900s, while two of the buildings were built in the 1970s. None of the buildings are designated or listed on the City of Toronto's Heritage Inventory." The original proposal was for a 49 storey (163 metres) condo with 514 units but the revised proposal now consists of a proposed 44 storey tower on the south end of the site stepping down to 18 storeys (61.4 metres) at the north end of the site. 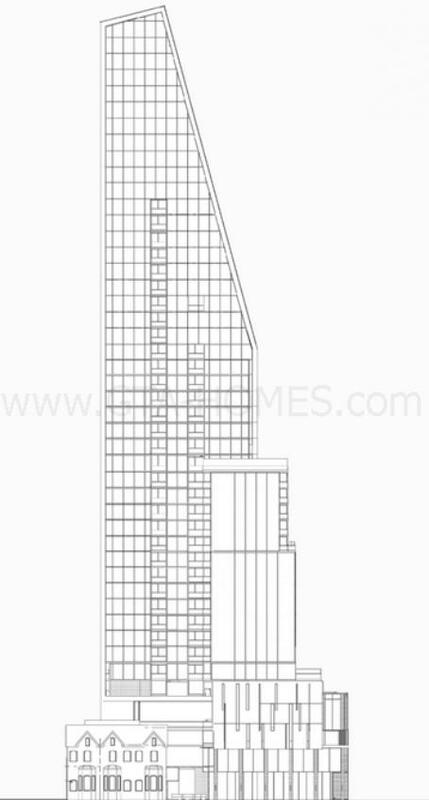 The revised architectural drawing revisions improves the original proposal by having the tower design within the 75 degree angular plane, stepping the tower down to the north and reshaping and slimming the tower's profile to reduce the shadow impact on the low-rise buildings located within the neighbourhood to the east as much as possible. It also provides a minimum 6 metre pedestrian sidewalk zone along the Yonge Street frontage, a 10.6 metre plaza at the north end of the site that will be privately owned and accessible to the public, 420 instead of the original 514 residential units and 192 parking spaces. "The revised base of the building is 18 metres at the Yonge Street frontage then steps back and up within the 75 degree angular plane to a lower 18-storey height at the north end of the site then to a higher 44-storey height at the south end of the site." The revised proposal also includes to "retain the heritage properties at the north end of the site at 7 and 9 Gloucester Street and support heritage designation on those properties including a heritage easement agreement registered on title". The number of larger units will also be increased to provide more family sized units. The Clover Condos will have four levels of under ground parking proposed for 192 vehicle parking spaces with access from Gloucester Street on the north side of the site. Of the total 192 parking spots, 166 parking will be for residents of the building and 26 will be visitor parking spots. There are also 427 bicycle parking spots proposed. The development site area is about 3,164.4 square metres in size with a total gross floor area of about 38,459 square metres. Of the total 420 residential units proposed, 49 (12%) are bachelor units, 147 (35%) are 1-bedroom units, 87 (20%) are 1-bedroom plus den units, 58 (14%) are 2-bedroom units, 49 (12%) are 2-bedroom plus den units and 30 (7%) are 3-bedroom units. There are also 840 square metres of indoor and outdoor amenity space proposed for this building. There are 1,268 square metres of retail space proposed and 2,118 square metres of office space proposed.The Clover on Yonge Condos is located in the Church-Yonge Corridor near the Yorkville neighbourhood of Toronto. 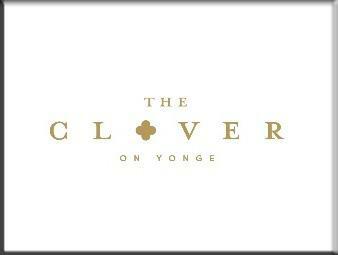 Register with us today for more information on The Clover on Yonge by Cresford Development Corporation! For more information, please register today for The Clover on Yonge Platinum Access Preview Event.